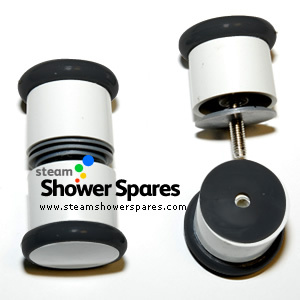 These shower door knobs are made form white plastic material with a black detailed coloured ends. The fit through a single hole to provide a knob on both the interior and exterior of the shower cabin. Supplied in pairs to furnish a pair of shower doors. An alternative item to this is the Chrome finished knobs which fit the same diameter holes.